Some days we find good news in the in-box. Here is some -- but it is only half-way complete. For several days people fretted over the fate of Rodney and Lady, a couple of dogs being held in a local kill shelter. It was obvious from their photos that they had been well cared for, that they were adorable and that they didn't deserve the needle just because somebody decided to dump them when it became inconvenient to have them around. Word went out via the Companion Animal Network. Their photos were posted on websites, e-mailed from office-to-office, from person-to-person. People all over worried about the fate of these two dogs. They are, I must remind you, only two of scores and scores and scores of dogs and cats that face death daily in kill shelters all over North Texas. But we know now that at least these two have been saved. Gail Whelan of Companion Animal Network e-mails, "We have not found a foster yet but we pulled them from the kill shelter anyway. Maybe it was not the smartest thing to do, but just look at these two! Lady needs to lose some weight, but they are both beautiful and sweet dogs. Rodney is six, Lady is 4 and they are current on all their shots. They're also "fixed." And they should go together, Gail says. "Rodney is very protective of Lady and they are a matched set." Thank heavens Companion Animal Network has stretched itself a little thinner to take in these wonderful dogs. Now, we must realize that out there in the world there is bound to be someone who needs these dogs but just doesn't know it yet. It's time to forward more and more e-mails about Rodney and Lady. Feel free to copy this post and send it along. Send the link. Do what you can so we can report the "happy ending" segment of The Story of Rodney and Lady. CARING FOR CASSIE: Perhaps you are familiar with the work of Carole Sanders and Animal Angels. The rescue group is like the rest of us -- things work just fine until we're surprised by unexpected expense. In this case, Cassie is the "unexpected expense." 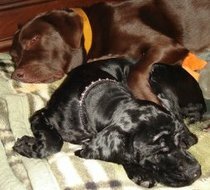 Sue Owens sent us the roundup of the story: "Cassie was hit by a car and found by a local postman as he made his rounds. He picked her up and put her on the porch of the nearest house and then had to keep his schedule. When he came back by, she was still there. He brought her to our vet's clinic where it was determined that she had a broken leg, scrapes and abrasions and that several of her baby teeth in front, top and bottom, had been knocked out. "All in all, she is a pretty lucky little girl. So often a contest between a puppy and a car results in the death of the puppy. Cassie will recover, but she'll need to rehab her broken leg at the clinic for about four weeks before she can be ready for adoption." Animal Angels has a "special needs fund" to which you can donate to help pay for Cassie's care. Write to it at Animal Angels, Special Needs Fund, 290 Knowlton Road, Jacksboro, Texas, 76458. Or, if you're a 21st Century kind of person, you can donate via PayPal at www.anmlangls.org. And, if you REALLY want to help, audition to adopt Cassie. By adopting Cassie, you'll free much-needed space for the next foundling. And, as you know, there's always a "next" one. As some of you may recall, Carole is the recipient of the Operation Kindness 2005 Sarah M. and Charles F. Seay Kindness to Animals Award. To receive that award, you have to be in the trenches of animal rescue. ANATOLIAN RESCUES: Something odd must be going on. 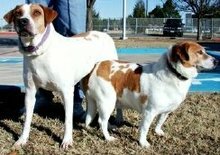 We've gotten notes from the National Anatolian Shepherd Rescue Network (www.nasrn.com) regarding a dog in a Denton shelter and a dog in a Fort Worth shelter. Anatolian Shepherds are really big dogs that some Texans use to guard goats and sheep. These particular dogs, however, are "pets." According to a note from Carleen Conyers of NASRN, the dog in Denton is a "must move now" dog or she will be put to sleep. The dog in Fort Worth faces a similar situation. Anatolian Rescue will help with transportation. E-mail anatolianrescue@yahoo.com to volunteer to help save these dogs. To see the Fort Worth dog, click HERE. Of this dog, Carleen writes, "The shelter workers tell us he is a very nice sweet-tempered dog, knows some basic commands and loves to 'give paw'." Oh, it's a big paw! HIGH FIVE FOR EXXON-MOBILE! Geez, I hope that doesn't mean gas will hit the "high $5 a gallon" mark. Seriously, we would be remiss today if we did not look at our diminishing savings account and give a congratulatory nod to the folks at Exxon-Mobil for being able to squeeze a ten zillion dollar profit out of last year's hurricane-whammed business dealings. Heck, congrats to ALL the oil companies. It must have been tough making a profit, the cost of gasoline being what it is. Frankly, weren't we all really tired of watching those oil company execs schlep around town in threadbare off-the-rack suits while driving Kia Rios bought second-hand from a hurricane reclamation center. Gosh, it just goes to show what you can do when you're really thrifty. Maybe this is the year Exxon-Mobil will publish a helpful handbook: Gouging for Dummies. Free with each fill-up. You know, if oil companies continue to make record profits, we ought to insist that they bring back service station attendants who check the oil and tires, clean the wipers and windshields and pump the gas. Aw, I’m dreaming. These companies have converted from companies that sell gasoline to companies that sell stock. We're going to start today's session with a real pig and we're going to end with a "real pig" (and I think you'll agree). HOGGING THE ATTENTION: Joe Cranford of Find-a-Pet, the non-profit outfit that reconnects lost critters and lost humans with each other, has a new challenge. A fellow from Seagoville called to say he'd found a 10-pound pig on Highway 175 about a month ago and needs to "find the little fellow a home." Well, of course, we don't know for sure that this is going to be a "little fellow" for much longer. Even those Vietnamese potbellied pigs can grow to be whoppers. About the only pig you can be certain of staying small is the guinea pig. And this Seagoville pig is a porker, not a rodent. If you're missing a pig or maybe even need a pet pig, get in touch with Joe at www.find-a-pet.org. "I can't believe it. 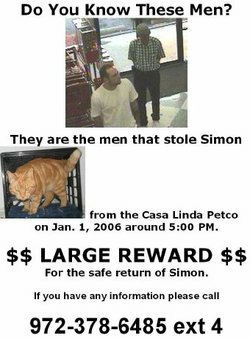 We have a new poster and are about to put out more ... We are up to $1,000 being offered as a reward fro the safe return of Simon." An anonymous Petco customer offered to match the Protective Animal League's $500 reward, says Dianne. Meanwhile, we should all continue to marvel that in a city with an unlimited supply of cats, someone felt the urge to steal one at gunpoint. Dallas: City of Nuts. 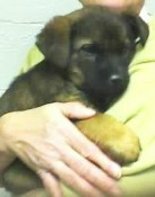 A HALF-DOZEN TO GO: Well, my goodness, the folks with the Friends of the Animals, the spay/neuter/rescue devotees at Cedar Creek Lake, have forwarded these photos of some pups that will be available for adoption in a few weeks. Here's how the note starts, "I have six of 20 puppies rescued from mother dogs abandoned after their owners moved away...."
The momma dogs had "had their puppies under an overturned canoe," says Lois Reller, longtime volunteer for Friends. Abandoning animals is against the law. So is speeding. Speeders we can understand. But, walking away from such a load of cute and adorable puppies...well, it's just such a bad thing. It a genuinely deliberate act of cruelty. THE 'REAL PIG' SPEAKS: Over the weekend, the Associated Press distributed a story about arresting a guy for organizing hog-dog fights in Florida. One of the people quoted in the story was Mary Luther who the AP said "described herself as the owner of the dog-fighting organization." It then quotes her as saying the hog-dog fights are "no more cruel than when I do bird hunting with my dogs." And, now, it occurs to me that I should apologize to pigs everywhere for using their good name as a way of referring to this mutant. Aw, heck, now I need to apologize to mutants. Anyway, don't you wonder if there's any way to get through to this pinhead (my apologies to pinheads)? How does someone develop this sort of "fight-the-dogs" mindset? What makes them think it's OK to have animals fighting each other? Should we write her off as terminally stupid? You know how the courts sometimes send people to anger management classes? Why couldn't people caught at dog fights be sent to therapy (in jail)? I'd start 'em off with an overdose of electrotherapy, but that's just me. God knows they need some kind of help. The optimist in me wants to try to save people like this, to reason with them. The realist wants to send to an island prison where they can fight each other for a can of rancid beans every other day. Idiots. Lock 'em up with the cat thieves. Oh, my goodness! Oh, my goodness, this really is the long and the tall of it. The long folks are mini dachshunds, the tall guy is a Great Dane. And there's the min pin, too. As you can see, this is a "Let Sleeping Dogs Lie" photo in progress. On the far right we have "asleep" (that's Piper, the mini dachshund) and, on the left, two cases of "drowsy." 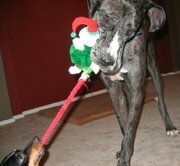 That's Tex the Great Dane on the left and Harley the Min Pin in the middle. And they're all under a blanket! So, for this weekend's "Let Sleeping Dogs Lie & Napping Cats Nap" we offer the "Blankie Dogs" from Chrystyna and Aaron Johnson's Frisco household. Chrystyna writes, "I know you like to get pictures of doggies and we've captured a few cute ones of our crew lately. People always tell me you can't get good animals from rescue groups or shelters. Well, my house would prove them wrong. We have four great rescue dogs running around our house and they are all awesome! 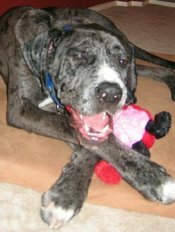 "Tex is the Great Dane and was adopted from Great Dane Rescue of North Texas in September. "Piper, the brown Dachshund, and Harley, the Min Pin, have been part of the family for years and they were both adopted from Operation Kindness. Princess, the black-and-tan Dachshund, is a foster from the Central Texas Dachshund Rescue. And as you can see from the photos, tug-o-war is a "family game" and sometimes the big dawg wins. Tex and Princess are giving the game a go. Let me take this opportunity to preach the value of big dogs. They're fun. They're huggable. They're everything you want in a small dog and more. Shelters take in small dogs -- they also adopt small dogs at a pace far faster than the adoption rate of big dogs. You can check this out personally by visiting any shelter in any town. Keep in mind that here at readlarrypowell.com we also endorse dachshunds and min pins and any other dog that comes in under shin-high on a full-grown man. You don't have to be a purebred to hold our affection. Heck, we're not purebred, why should we require that in our dogs or cats? It looks like Chystyna's dogs have found a great spot to enjoy life -- and they have found what we all hope to find: Security. And, oh, yeah, food. And, of course, permission to play and nap. During a recent siege of insomnia, I was flipping through ALL the cable channels -- I mean ALL of them -- when I happened upon a scene that looked oh-so-familiar without looking current. All the folks looked like refugees from the Sgt. Pepper era. Shirts were gaudy, skirts were long, etc. The man had sideburns, bushy hair and moustaches, the women looked, well, not nearly as goofy as the men. What I'd found deep in the night was a film from 1976, an educational film produced by KERA-TV about what people really want from shopping centers. This film focused on Olla Podrida. Ah, Olla Podrida.....Remember that wonderful little shopping center with the quaint shops and artists? It was at 12215 Coit Road, just west of Central, just south of LBJ and north of Forest Lane. Gosh that was a great place to shop -- it was very wooden inside with giant planks and rafters and columns on five or six different levels -- lots of stairs. Lots of 'em. May have even had a high-toned coffee shop before Starbucks was even born. The site was bulldozed a couple of years ago to make way for a school. The artists and merchants had to find new places to conduct business. Those of us who enjoyed "quaint" shopping in a city that's big on cookie-cutter strip shopping centers have had to leave town to find "quaint." Aw, heck, this is Big D, not Big Quaint. Of course, if you believe in these things, we shoppers weren't the only beings who enjoyed Olla Podrida. I've often wondered if, after the bulldozing, the ghosts that were said to inhabit Olla Podrida stayed on the property or moved on in search of more artists to haunt. I also wonder about the artists. Did they move on? Find better spots? Or was the closing simply the end of the line for lots of things -- surreal, supernatural and otherwise? I don't know if the Olla Podrida Ghosts are leftover from an airport mishap or if they were simply quaint spirits doing some quaint shopping. Not that I believe in ghosts, but I do believe in insomnia and shopping. SADIE NEEDS A HOME: This note was forwarded to us by noted canine assessor Cary Birdwell on behalf of Bart and Amy Scott of Mansfield. They have Sadie, about 4, a black German Shepherd mix rescued "from the streets of Dallas approximately two years ago." The formerly malnourished and ailing dog would be "a wonderful dog for the right person." Amy and Bart have decided to "re-home her because of some behavioral issues," they say in a note about the dog. "Sadie is very protective of her territory and leery of strangers, therefore she has a tendency to growl, bark and act aggressively to those that she has not bonded with. We recently had a daughter and , unfortunately, Sadie is not the type of dog who needs to be around young children....Sadie can be a wonderful companion and is an excellent watchdog, but she will need time and love to become attached to a new owner and surroundings." This dog isn't going to just anybody, Bart and Amy say, "Prospective owners must meet with us personally. An adoption fee will be required; however, we are willing to pay for a mutually agreed upon training program to help adjust Sadie to her new owner." To inquire, call either 817-473-9717 or 817-262-2463 (cell) or e-mail ascott@klng.com. Bless everyone concerned -- you know this can't have been an easy decision. KATRINA NEVER ENDS: Dog and Kitty City, the no-kill shelter near Love Field in Dallas, will be helping Utah-based Best Friends Animal Society (www.bestfriends.org) on Monday afternoon when a Best Friends truck carrying homeless hurricane dogs and cats makes a rest stop in town. The stop will allow drivers and volunteers to take a break -- but it will also allow the animals to get out and stretch or whatever they want to do. A spokeswoman for Dog and Kitty City says about 45 animals will be making the trip from the New Orleans area to shelters in Colorado. Dog and Kitty City is at 2719 Manor Way in Dallas. Call 214-350-7387. Visit www.dognkittycity.com where you can see adoptables and learn how to help or volunteer or adopt. Look, kids, even before those darned hurricanes the shelters in the Dallas area were overcrowded. The hurricane influx only emphasized how awful the unwanted animal problem is around here. JEFF CRILLEY SPEAKS: Fox 4 News reporter and author Jeff Crilley, a genuinely nice guy, will be guest speaker at 7 p.m. Saturday at the Lone Star Miniature Schnauzer Club meeting at Back Country Bar B Cue, 6940 Greenville Ave. The event is open to folks from all breeds, non breeds, mixed breeds and hopeful breeds and people who simply are fans of Jeff and his reporting. (E-mail efhoover@sbcglobal.net) Jeff, an Emmy-winning reporter, is author of Free Publicity-A TV Reporter Shares the Secrets for Getting Covered on the News. WILD LIFE? The DFW Wildlife Coalition folks are hosting a free seminar Sunday on handling wild animal problems at your home. The seminar is from 2 p.m. to 4 p.m. in the Community Meeting Room of the REI store, 4515 LBJ in Dallas. You don't need a reservation. FROM A TIPSTER ABOUT D.A.W.G.S. : A reliable tipster points out that there's an informative note at www.dogsafety.net regarding the Dalhart shelter D.A.W.G.S. that is having trouble finding a new home after a municipal flap. Take a gander. Or take a dog. I'm not sure they have any ganders available. Just from casual observation, it appears that Dalhart's leaders thought a kid-sponsored dog shelter was a great idea until it turned out to be so successful that it affected the neighborhood. CALENDAR IRONY: You know how you put things off until it's too late. I kept putting off buying some Operation Kindness 2006 calendars until, well, son of a gun, they're SOLD OUT! That's right. They're out of the calendars -- here's the rub: My sweetspouse Martha and I not only helped pick the photos for the calendar, but I wrote a little deal about friends for the calendar. So, if anybody has a spare, I'd be happy to buy it from you. It was one of those Christmas shopping season "I'll pick that up tomorrow" deals. I just can't be trusted to run my own errands. In the meantime, here's a reason I need to remember to buy a 2007 Operation Kindness calendar: Yesterday, a nice woman named Marie Lee asked me to speak to a meeting of her favorite club in May of 2007. That's May of 2007. The irony in that? The name of the group is the Serendipity Club. I'm not sure you can be practicing serendipity if you've planned your speakers that far ahead. Well, I know I'll have at least one good day in 2007! I'll put it on the calendar when I get one. The dogs are Lady and Rodney and they're housebroken, mannerly dogs who should probably be adopted together. But, in the interest of just saving their lives, one home each would work for now! They are currently in a local kill shelter and this is the day these two dogs will die if no one steps up to save them. At this point, their only crime is being unwanted. Immediately e-mail canadoptions@yahoo.com if you can help. Here's a way to demonstrate that one has successfully achieved "geezer" status: One watches the TV weather like a kid watches cartoons. Some people watch it for information. Some watch it for fun. For example, as clouds drew darkness over Dallas Wednesday evening, the Fox 4 weatherman, whose name escapes me, alluded to something from last week's rain. He used the phrase "left over soil moisture." Sometimes, if enough soil moisture is left over, we call it "mud." "Left over soil moisture" is the funniest weather phrase I've heard since "rain event." "Rain event" sounds like not only is it raining, but in the big middle of the storm, The Beatles will reunite to back up Elvis on a medley of his hits. Now, that's a "rain event." Though, of course, if we were to have a steady few days of rain, in the big middle of this drought, we'd have ourselves a genuine "rain event," wouldn't we? This photo, by the way, represents what you could have seen this morning had you been sitting in my office chair and trying to work on the computer. 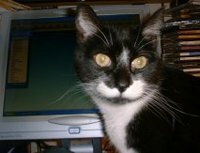 Poirot, who is as zany as he looks, has been known to insinuate his sincere catness between humans and the work at hand. He moved on shortly after this was taken. He has rounds to make, you know. ASSORTED CAT NOTES: Remember years ago when Gremlins was a hit movie and half the puppies in the world were named "Gizmo?" Might we be expecting something similar as the new Emma Thompson-Colin Firth movie hits the screens? Doesn't Nanny McPhee sound like the perfect name for a cat? I know that later on today we'll discuss a puppy named "Colin" but, when it comes to naming a dog or cat Colin you never know if it's honoring Colin Firth or Colin Farrell, though, of course, if you're getting a formerly "wild" cat from a rescue group, Colin Feral might work. Colin Furth will work for any fur-bearing species. ... Speaking of cats, a note arrived a couple of days ago: a woman was looking for a cat. No, she hadn't lost one. She was looking to adopt one and didn't really know where to start. Readlarrypowell.com advised her "just about anywhere around here" and the cat selection process is underway. She didn't want her e-mail listed because she didn't think she should get that many e-mails flooding her work computer. Frankly, in Dallas, if you put an open can of cat food on your front porch at midnight, by sunrise you'll probably have 15 or 20 cats, a couple of raccoons and a possum. ... In the meantime, a note arrived that read "My mother has four kittens that need homes." The number to call is 972-313-2336. "Spay/neuter" philosophy is being preached in this case. ... If you should have trouble finding a cat in the immediate Dallas area, the folks at Friends of the Animals, the spay-neuter-rescue outfit at Cedar Creek Lake, recommend a website set up by one of the Friends. 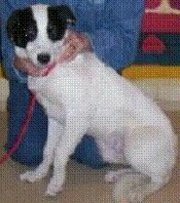 It's Stacey Elfarr's rescue, rehab and adoption site, www.athenslittledarlings.com. If you click on that right now you'll see Tammy's seasonal project -- Valentines sent anonymously to homes where dogs are chained. There's no need to stir up a neighborhood fight when all you want to do is save the dog. So, you team up with Dogs Deserve Better to get a Valentine reminder sent to the human that nothing good comes from chaining a dog. In fact, nothing does. They grow lonely on the ends of chains. They get sick. They die on the ends of chains. And, tragically, when the chain breaks, the unsocialized dog goes on a rampage and kills -- other dogs, cats and sometimes children and adults. The efforts of Dogs Deserve Better are aimed at making humans responsible. It's a chore to make some humans responsible, but until they let animal rescuers start applying stun guns and cattle prods, a gentle Valentine reminder may be the most effective tool. SAVING AT THE BANK: A few days ago a fellow named Gary Johnson sent out what amounts to an "emergency e-mail" that began "There are 2 puppies outside of my office building....and I can't catch them." All rescuers have felt that frustration -- dogs and cats moving too quickly and to slyly for their own good. Gary's note went to the Companion Animal Network. They don't call it a "network" for nothin'. The situation was that the dogs -- who knows where they came from? -- had curled up by a tree next to the Chase Bank Building drive-through entrance at 1825 Market Center Blvd. This is, of course, not in the middle of a ghost town. This is a busy neighborhood. So, you have to always be careful about flushing these stray rascals into the street. "One of the girls in the office put some food out, but they will not eat," Gary wrote. Oh, my, but they're eating now. Of course, they're in custody. Gary's note saved the day for them. The three dogs were "captured" and saved. Of course, it's obvious from their photographs that they have retained the characteristics of the wild beasts on the veldt. Look at the anger, the resistance, the struggling....well, maybe not. Gosh, they sure look happy to be held, don't they? The fellows are, in order of appearance, Chase, Clint and Colin. Gail also writes, "Thank you to Gary Johnson for sending out an urgent e-mail about them and to Debbie Agnew for stepping up to foster these puppies." So, because some humans did the right thing, these puppies have a genuine chance at living happily ever after. That's kind of a nice thing to have on your permanent record, isn't it. Notes: I made a note to myself. It reads "bearede" and if you can figure out what it means, you're ahead of me. It's early in my day and I can't remember making a note about a bear or bare. I'm accustomed to making hand-written notes to myself on an index card or scrap of paper in the middle of a movie or the middle of the night and not being able to read it the next time the lights are on. But "bearede" is a note I made on a computer keyboard and sent to myself. It'll come to me shortly, surely. LOGAN: The little dog named Logan who was at risk in the Ferris Animal Control shelter last week (see Jan. 20 item) has been taken into a foster dog program, thanks to A Different Breed (www.adifferentbreed.org.) He'll be available for adoption in a couple of weeks -- some neutering is in his future. Here's Desi's story, thanks to Julie Maupin: He's about six months old and first came to the shelter with his siblings as a puppy. A few months later, he was brought back. A member of the surrendering family said "all Desi did was hide under the bed." This was odd because, before he left the shelter, he was Mr. Congeniality. OK, you veteran animal people get the drift. Something happened. Turns out he's now afraid of men. When a man comes into the shelter, Desi "hides" in the back of his cage. Other than that he's weet and well-behaved. He weight in at about 25 pounds and probably won't get larger, the shelter folks say. Julie writes, "He needs to learn that he can trust....He is quite striking! He has the look of a terrier in his head -- but his coat is not slick, not long either -- and he has a plumey tail!" The Corsicana shelter also has, Julie writes, "a big, beautiful 9-month-old male black shorthaired cat named Neptune." REBOUNDING PAVLOV: Well, this is just another case of a dog still searching for the right home. Dot Lott of the Flower Mound Humane Society says this little guy, Pavlov, has "been adopted and returned a couple of times because of his energy level. He is a super-sweet dog with adoring big brown eyes and I just know the right family is out there somewhere! "The last couple brought him back because he is more of a 'people' dog than a 'dog' dog, although he does get along with other dogs. He would just rather play with humans." Here's the "backstory" on Pavlov: He's a Hurricane Katrina dog. So, of course, because of his extended period of time in, using a charitable term, "uncertainty," he's in need of some training from someone with patience who undestand that he has a "short attention span," according to the evaluators with FMHS. They also says he's loyal and a good "guard dog" and that he "enjoys having his crate as his special place to relax He is housebroken and therefore his foster family simply leaves the crate door open at all times." 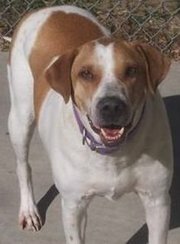 To see about getting this great self-crating dog, go to www.fmhs.org. A MAN WHO MADE A MARK: Veteran Dallas-area broadcaster Don Keyes has died. You can read about this at broadcast consultant/ex-disc jockey Larry Shannon's website www.radiodailynews.com/rdndaily.htm . Don, who befriended many a newspaper columnist with his knowledge of radio history and patriotic notes, was a, well, "keye" part of the Gordon McLendon radio empire during the big rock era of KLIF when it was "The Mighty 1190." BEAREDE MYSTERY SOLVED -- IT'S BEARDED: "How's that for irony?" asked the bewhiskered blogger. Yes, "bearede" is really a mistyping of "bearded" and "bearded" refers to a dog that is in the care of the Companion Animal Network. 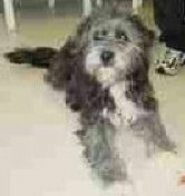 Gail Whelan send us a note about this guy, Verdal, a Bearded Collie coming into the Dallas rescue group from Longview on Saturday. CAN is looking for a foster home (or a permanent home, of course!) for Verdal. E-mail canadoptions@yahoo.com. Here's the thing about Bearded Collies -- they're topics of conversations that usually begin "What kind of dog is that?" In case you wondered, "collie" is a Scottish word for "herding dog." (You can check all this out at the Bearded Collie Club of America home page http://beardie.net/bcca/.) As you know there are rough, smoothie, border and bearded collies. This reminds me, that my late friend, the author/politician/riotously funny Milt Hartsell, former mayor of Rodessa, La., once got his kids a collie-looking puppy and when they asked him "What kind of dog is this?" he told them, "It's a sort of like a border collie. It's a 'brink collie.' Yeah, it's right on the brink of being a collie." Milt, who lost a battle to cancer a couple of years ago, wrote a wonderful book called Some Bright Morning, I'll Fy Away. It was about childhood in the oil fields along the Texas-Louisiana border -- where there may be border collies but not border collies named for that particular border. Maybe I'm a little sappy today, but this made me miss Milt -- he was a great newspaperman. He once wrote a column reminding people that the phone company was going to blow soot out of its lines and customers needed to take a rubber band and fasten a paper bag around the mouthpiece so the soot wouldn't fall onto the floor. As you may expect, he got calls -- not just from the phone company but from people wanting to make sure they properly bagged their phones. THREE CATS READY TO GO: Rebecca Poling is looking for a home, two homes or three homes for these 12-week-old kittens. That's sort of appropriate since you could consider three kittens to be a "group" and Rebecca is the "Member Groups Coordinator" for the Metroplex Animal Coalition. Members of this kitten coalition are Franklin, Winston and Ember. and they're all vaccinated, tested and "fixed" so, as they say, they're "good to go." Franklin is the "leader of the group and the most affectionate," Rebecca says. "Winston is the shyest and definitely the clown of the bunch. And Ember is a little princess who thinks the world revolves around her. FOUND AND AVAILABLE: Andrea Spyres reports that "Sean and I found this baby at an investment house we bought. The previous tenants had left her there with no food, water or shelter to fend for herself. She is very loving and just wants to be around people. She does not have an aggressive bone in her body." You'll need to audition to adopt Raven, a rottie/collie mix, they think. Raven is about 70 pounds, spayed, upt0-date on shots and is "sweet, loving low-key -- she jsut wants love and belly rubs," Andrea writes. She also says she must be an indoor dog -- we can all endorse that! One more thing: The previous tenants should know it is against the law to abandon an animal in Texas and I hope someone with the info about the people will contact cruelty authorities and get the hounds of the law chewing on their worthless....OK, I must stop there in the interest of decency, but you know what I hope gets a big bite taken out of it. Write this down: Change is the only constant in life. Yes, the only constant in life is change. Works either way. Like change or not. You've, no doubt, seen familiar service station signs (Exxon, Diamond Shamrock) coming down and being replaced by "Valero." "Who is Valero?" the casual observer may ask. Ah, it's a San Antonio-based company. How Texas is it? Pretty darned Texas. Valero is as Texas as the Alamo. In fact, it is the Alamo. So, here's the answer, and you'll remember it: The Alamo's original name was Mission San Antonio de Valero. You can look it up at www.valero.com or Google "Handbook of Texas" and "Valero." 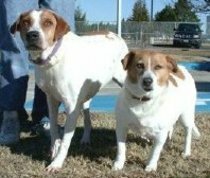 A COUPLE OF DOGS THAT NEED A HOME: These dogs are Rodney and Lady -- that's Rodney standing. The folks at Companion Animal Network say they were brought into a "kill" shelter together by a family that claimed to be moving and wanted to give the dogs up to a good home. Rodney is about 7 and neutered and Lady is about 4 and spayed and they need to go to the same home because they're bonded. They're "very well mannered, " the Companion Animal Network folks say. To help give them a temporary or a permanent home, e-mail canadoptions@yahoo.com. You know, when those dogs were little, they probably thought they had a good home for life -- bless their hearts. They sure look loveable, don't they? LAUGH IT UP AND TOWEL OFF: This is a dual message from Friends of the Animals at Cedar Creek Lake, a genuinely active rescue and spay/neuter group. As you know, if you're into animal rescue, you'd better be ready to laugh. It's helps you get through the tough spots, like when a rescued cat decides the backseat in your new car needs "marking." So, with an eye toward fundraising and a heart set on laughter, the Friends of the Animals folks have scheduled their Second Annual Comedy Night with live improv and skit comedy. It's set for 6 p.m. Feb. 12 at the Main Place Cinema in Seven Points. There'll be door prizes, raffles and other things. The tickets are $10 each and that ticket price includes a drink from the concession stand -- I don't know what the regular price of a theater drink is in Seven Points, but in Dallas, theaters price soft drinks as if they were pouring liquid gold into platinum cups. If you want a candy bar, they have a loan officer standing by...OK I'm sure things are more reasonable in Seven Points, and besides, this Friends of the Animals Comedy Night is for the benefit of animals. Tickets are available in advance at Bluebonnet Emporium in Gun Barrel City, at Citizens State Bank in Mabank and at the Friends of the Animals Spay/Neuter Clinic in Gun Barrel City on Tuesdays. Last year, Comedy Night sold out. And, frankly, if you've kept up with the news, things have gotten a lot funnier since then. In the meantime, here's something Friends of the Animals needs in addition to money: towels. "Extra or old" will work. So will new. The towels are used at the spay/neuter clinic near the intersection of Highways 198 and 334 in Gun Barrel City. Call 1-903-887-PETS (that's 7387) for an appointment or to help or to arrange delivery of a truckload of free towels. You can also drop the towels off at Bluebonnet Emporium, 702 W. Main, Gun Barrel City. The Handbook of Texas says Gun Barrel City's name comes from the motto "We shoot straight with you." That's unlike Dallas' motto: "We shoot straight at you." Feel free to use that on Comedy Night. A BOXER UPDATE: Well, nothing is ever as simple or as inexpensive as you hope. 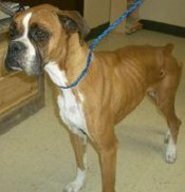 For example, if you go to www.savetheboxers.com, you'll see pictures of Piper and Pumpkin, a couple of rescued boxers. And poor Piper had been hit by a car but had enough drive left to run off and hide. (That's pre-surgery Piper.) As I've often noted, dogs are too clever for their own good. Piper's elusiveness led to irreversible muscle atrophy in that back leg and, as Legacy Boxer Rescue volunteer Marla Margol says, "the leg could not be saved." So, Piper's now a three-legged dog, but as those of you who have three-legged dogs will testify, dog's often don't notice they're just operating on three legs. They're still dogs and they're still ready to romp. When you go to www.savetheboxers.com you'll see these dogs -- and others -- and you'll see a way to donate to their care and the care of boxers that will find their ways into the program in the future. You'll also see that you can step up and volunteer to foster or volunteer to adopt a boxer. 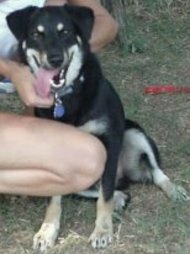 TODAY'S HAPPY ENDING: You may recall Bandit, the black dog that wandered up to a home near Lake Texoma and immediately began to charm people. We wrote about him on Jan. 17 (scroll down and check out the original story). Here's the info that arrived yesterday from his benefactor, Mark Wallis: Bandit's now living on a farm in Southern Oklahoma. "The last we heard (Friday evening) he was in the bedroom of his new owner's 9-year-old son helping build an indoor tent that they both were going to sleep in. Sounds like a perfect home for Bandit ... a large farm to run and play on, another dog friend (their female 2-year-old Lab) and a 9-year-old tent-mate. a Bandit heaven-on-earth." Ah, feels good to know that Bandit's found a home. While watching TV, an astounding offer raced across the screen. It invited a family of four to enjoy Disney World for seven days and six nights for $1,500. Parents must have a lot more money these days than when I was a kid or when my kids were kids. If we'd have had $1,500 at one time when I was a kid, we'd have used it for a life-saving operation. I guess, though, $1,500 will make a lot of memories for a family of four these days. I also suspect, it'll make some money for a credit card company. Alas, maybe Disney will take some of the profits and restore the old Hardy Boys (the mystery tales with Tim Considine and Tommy Kirk) and Spin 'n' Marty (the dude ranch series with Tim Considine and David Stollery) to the Disney Channel. Those shows were reasons I signed onto that cable channel in the first place. Those shows and Annette. A DANCE FOR CHARITY: Our "retired" animal rescue buddy Audrey Merritt sends word about a Valentine's Dance benefiting the non-profit Chrystie's Kids, a charity named for her late daughter, victim of a hit-and-run a few years ago. The charity, which works with needy kids, will host a "Heart of My Heart" Valentine Dance at 6 p.m. on Feb. 11 at the Champions Club at Texas Motorplex in Ennis. Tickets are $50 a couple. (Call 972-875-1597.) Music? You bet. By The Cadillax. FOUND DOG: Carolyn Maurer reports finding this dog wandering on Parker Road on Jan. 17. The dog is blind and older, but "sweet, well-cared for, docile and very much misses her owner. She was navigating the median on Parker Road just east of Coit in morning traffic. A postal worker grabbed her off the street and I opened my car door and in she went," writes Carolyn. 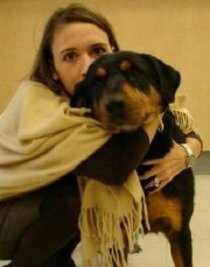 "I have kept her at my home, as the animal shelter would only keep her 5 days and stated she would be an 'unadoptable' dog. 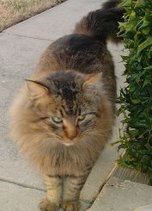 "I have left fliers in neighborhoods, at area vets and grooming and boarding places, made the routes of PetsMart, PetCo and Canine Commissary, listed her on www.find-a-pet.org, will be faxing info on her to the SPCAs. She had no collar or tags and is not microchipped." So, readers, there you have it: Someone -- Carolyn Maurer -- is trying like the dickens to do the right thing by a good and faithful dog. If you know where this dog belongs, contact www.find-a-pet.org or give a call to 972-867-2145 (office), 972-517-4573 (home), 972-839-3044 (cell) or e-mail cgmaurer.phd@comcast.net. On Sunday, Carolyn e-mailed that she is calling her "Sweetie" and "Sadie" and that "she is grieving...not eating today." Someone knows this dog. Surely. BUNDLES AND BUNDLES OF JOY: Anne Visser of Golden Retriever Rescue of North Texas began her note with "our big news -- it's raining puppies at GRRNT. Yes, the Golden Stork visited and we are now the proud guardians of 11, yes 11, adorable one-week-old Golden Retriever puppies AND their mom Winnie. "Winnie is only 2 1/2 years old. She was turned over to GRRNT when her human family was transferred out of state. The pup's father, an AKC registered golden, found a home before the move. "We all thought we'd have more time to get Winnie settled before the big event, however, she went into labor shortly after being released to us." This will be Winnie's last litter -- as you know, spaying and neutering are the Gospel of Rescue. The pups are so sweet -- well, consider their names: Snickers, Tootsie, Baby Ruth, Godiva, Nestle, Hershey, Twix, Rolo, York, Heath and Reeses. "As you can imagine," Anne says, "This is a huge drain on GRRNT's financial resources and it's only January. We are committed to getting these puppies ready for adoption and that means 11 sets of shots, 11 check-ups, 11 de-worms, six neuters, six spays (including Mom), and 12 microchips. "We are going to be starting a donation drive on our website in about a week." 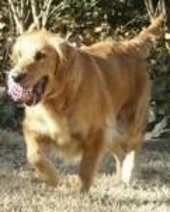 You can connect to Golden Retriever Rescue of North Texas by going to www.goldenretrievers.org. You can click on "Make a Donation" and read about the Rocky Fund that'll support these Goldens and others. And, heck, you might also inquire about adopting one or two of the little guys or mom and mom. You know they've already got a loving start in life. LOST DOG, FOUND CAT: The lost dog is a family's "fox or rat terrier" that darted away when a worker opened their car door at a car wash/oil change facility at 198 & 334 in Gun Barrel City. If you know the whereabouts of this brown, black and white little rascal, e-mail TinaTinaH1201@wmconnect.com. Coincidentally, in the general area of Cedar Creek Lake, "a fabulous gray tabby, Mr. Grey, is in need of a forever home." We get these reports from Sydney Busch of the Friends of the Animals at Cedar Creek Lake. Click HERE to see the Friends website. Meanwhile, Mr. Grey simply "appeared one day" and hasn't left the neighborhood he adopted. "He is not neutered yet, but will be," reads the note about Mr. Grey. To see about adopting the handsome guy, call Lezli Ragland at 972-241-2428 or e-mail lr_mt@hotmail.com . RAIN: How about that weekend rain? Wasn't it great? It was winterful, wasn't it? Finally, something filled Dallas' potholes besides hot air. There seems to be a sort of relaxed attitude in this week's "Let Sleeping Dogs Lie & Napping Cats Nap" photo. That could be because the cocker spaniel has a place to relax. That’s Yuki taking a snooze break with her pal Charlie. Speaking of relaxed, my funspouse Martha is celebrating a birthday today [Jan. 21] . I can’t tell you how old she is -- we have a pact. She’ll have a birthday and I’ll keep my mouth shut. Now, back to the slumbering spaniel. Beverly Miles of DFW Cocker Spaniel Rescue says the cocker spaniel, was found in Blue Ridge. A family -- a family that had once adopted a cocker from DFW Cocker Rescue -- took in the stray. They hoped someone would claim her, but suspected that she was a case of "shove-out-and-drive-off." When no takers turned up, they handed her over to the rescue group. 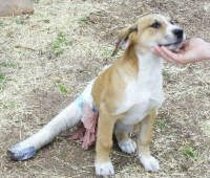 She was afflicted with mange, which Cocker Rescue treated. (As you may know, rescue gets the joy of rescuing the animals, but it also gets the bills.) The dog was named Molly. Then, when she was healthy and her hair was returning, she was put up for adoption. 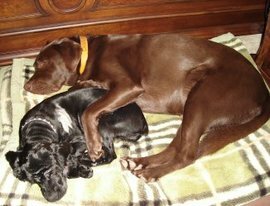 "Both Charlie, who is 5, and Yuki, who is about 9 months, were 'rescues' of sorts for our family," writes Molly. "Charlie joined our family last summer when his owners were moving from Tokyo, Japan, (where we lived at the time) back to England. "Charlie would have to be in quarantine in the UK for several months and then his owners' new home did not have space for him. We gladly adopted him and brought him back to Texas when we moved home in September. "We compare Yuki and Charlie to 'Oscar Madison' and 'Felix Unger' of The Odd Couple. "Yuki is free-spirited, sloppy and a non-conformist, much like Oscar. Charlie is very well-behaved, well-trained, submissive and very tolerant of Yuki. Although they are quite different, their relationship is a great one. We're hoping that our Felix can teach our Oscar a thing or two." So, the family's happy, the dogs are happy, rescue is happy to have made the match. And little Yuki obviously has a nap partner. Yes, they let the sleeping dogs lie while they snapped the photos.